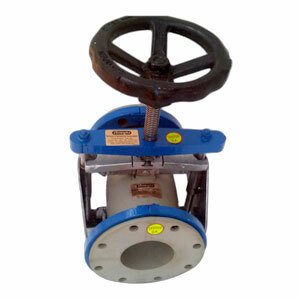 Open Body Fabricated Pinch Valve, Gujarat, India. DRILLED TO ANY STANDARD – DIN, ANSI, BS, IS, OR AS REQUIRED. - EASILY REPLACABLE ELASTOMERIC SLEEVE. - FLANGED ENDS & DRILLED TO DIN, ANSI, BS, IS, OR AS REQUIRED. - CONSTRUCTION TO HANDLE ABRASIVE CORROSIVE MEDIA. ATTN – WE HAVE FULL CAPACITY TO DEVELOP ANY DESIGN PINCH VALVE. AS WE HAVE ALL FACILITIES ASSOCIATED WITH PATTERN & DIE MOULD SHOP, FOUNDRY, RUBBER MOULDING SYSTEM WITH CAPACITY OF BIG SIZE RUBBER MILLING SYSTEM, BOILER, MACHINING & ASSEMBLY UNIT. i.e. FROM DRAWING TO FINAL FINISH PRODUCT AVAILABLE READY STOCK OR AT THE EARLIEST. Open Body Fabricated Hand Wheel Operated Pinch Valve features are simple, lightweight, which allows for easy visual verification of sleeve position. Address: A/46/FF, UDAY INDUSTRIAL ESTATE, OPP. ODHAV POLICE STATION, ODHAV, AHMEDABAD-382415. Gujarat, India.